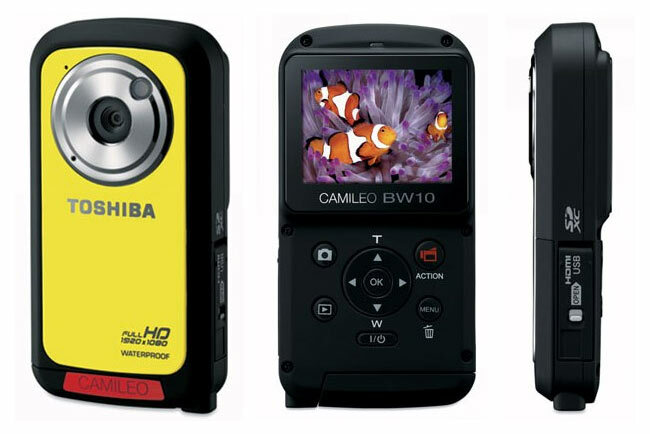 Toshiba has just unveiled their very first waterproof and weather-resistant camcorder, named the Toshiba Camileo BW10. The new Camileo BW10 is capable of recording footage up to full HD 1920 x 1080 @ 30fps and includes its own video stabilisation feature. Its also equipped with a 5.1cm LCD screen, and integrated HDMI connectivity allowing recording and images to be played back on HD ready TVs. Together with a 10 x digital zoom which can be used while taking still images or recording video has a 5MP CMOS image sensor for still images up to 5 megapixels, with an ISO 1600 sensitivity. The Camileo BW10 is compatible with SD cards (SD, SDHC, SDXC) up to 64GB in capacity, providing enough storage space for up to seven hours of Full HD video content in file formats: MP4 (video), JPG (still), AAC (audio), and is waterproof down to 2m. The new Toshiba Camileo BW10 will start shipping at the end of June 2011 for around £129 or $211.